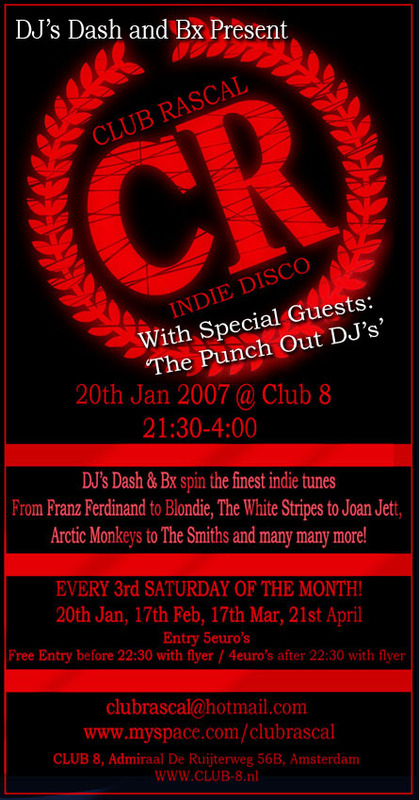 So 2007 is well under way, but it only truly starts on Saturday 20th when the Rascal DJs start spinning those indie tunes at club 8 again. Also to kick it all off we have the POPTRASH DJ's Patrick and Robert opening the night with their own blend of tunes to get you moving on that Rascal Dancefloor. Plus as always there will be the 'Club Rascal Mix Tape' mixed especially by DJ Bx this time for the taking, just come ask for one until supplies run out. So we hope to see you all there for what's gonna be a banging night of indie dancefloor action! P.S. come early to avoid the cue on the steps! !